Passed away at the Neepawa Hospital on Saturday, August 25, 2018 at the age of 93 years. Olga (Santo) Rossnagel was born in Sárospatak, Hungary on October 4, 1924 to parents Alex and Kathleen (Gal) Santo. She immigrated to Canada with her parents in 1927 and grew up on the farm they established 5 miles northwest of Plumas, Manitoba. She married Alfred Rossnagel of Plumas on July 15th, 1948. They began farming north of Plumas on SW21-17-12 where they built a home in 1961. 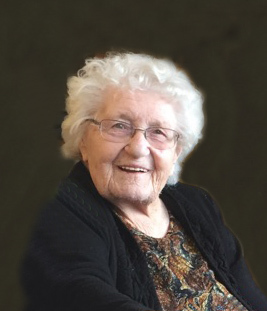 Mom remained on the farm until recently when she moved to Centennial Apartments in Gladstone and then to McCreary Personal Care Home, where she enjoyed her final years with numerous new friends and acquaintances until her final few days at the Palliative Care Unit at Neepawa Hospital. Mom’s greatest joy was when her grandchildren and great grandchildren came to visit, play games, show her pictures and videos, help her fold laundry or even blow bubbles. She loved talking and spending time with family and friends and spent many years in the Plumas Legion Auxiliary. Baking was by far her favorite lifelong activity and she would readily prepare baked goods for the local fair, picnics, trips to the field or just about anyone that would accept a bag of cookies, donuts, walnut rolls or, of course, her famous cinnamon rolls. Olga was predeceased by parents Alex and Kathleen, husband Alfred, son Mickey, daughter baby Rossnagel, sister Kathleen and brother-in-law Lloyd Cole, and brother Julius. Olga leaves to mourn her son Lorne and Deborah and their children Alyssa and Nils Schear (Briar) of Lakewood, CO, Andrea and Trevor Bjarnarson (Aiyana and Paisley) of Winnipeg, Aaron Rossnagel and Natasha Zariwney (Wyatt and Carter) of Plumas, daughter Jeanine and Randy Court of Plumas and their children Gary Court and Hiromi Ishihara of Calgary, and Tracy Court of Plumas, and son Neil and Judy Rossnagel and their children Declan and Kiera of Tenby.